Cut a groove in the sacrificial board, insert the tenons in the groove, and run it all through the planer. With the setup shown below, I can easily run 4 boards through at one time. (I'm only showing 2 in this example) My only concern is that the sacrificial board(s) will be planed cross grain. From a safety perspective, is there any reason I shouldn't try this? Yes, I know I could do the same thing with a sacrificial board running with the grain, but I'm sure this question will start an interesting discussion, as usual. Snipe can occur at both ends. I would just take a sacrificial board (or two) about 4" longer than the pieces you need to plane down and place one on each side of the sacrificial board. Each would be about 2" from the ends of the sacrificial board. True. My example set up didn't show the trailing sacrificial board. Didn't have one available for the picture. Yes, that is an option, except that some of the boards are up to 5' long. I have boards that I can grove and send in cross grain, but I don't have any long boards to use as sacrificial boards. 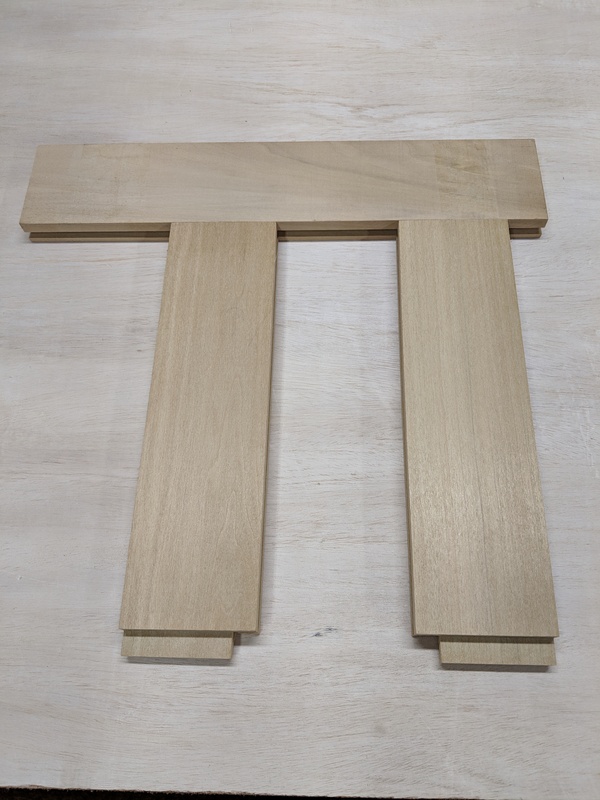 Can you use short sacrificial boards on the sides of the leading and trailing ends to accomplish the same goal or will something happen to the cutter head once the leading boards have gone past and then again when the trailing boards are engaged? How are you proposing to keep the trailer in place? 90-degree cross grain is scary...but if you only take paper-thin passes and with poplar you've got at least a _reasonable_ chance you won't have an explosion. What _can_ happen is instead of a knife cutting cleanly, the piece of material simply fractures and throws chunks back at you (damhikt). Don't have one, not going to buy one. Have old hand-me-downs which I don't plan to refurb and/or learn to use. I'll never recommend 90-deg cross grain in a planer again--it was that scary (albeit it was a case where I "just wasn't thinking!" and did have it set at a cut but at least for me, it ain't something I'm doing again. A possibility, although the final thickness of different boards may vary. Determining how much needs to be removed on a board by board basis is not known at this time. I'll explain why later. Sorry, I gotta call BS on that one. Newsgroups, forums, youtube, magazines, etc. are filled with the line "If you don't have a jointer..." followed by a workaround. There are thousands of woodworkers that have built lots of stuff without a jointer. I've built beds, bookcases, base cabinets, a cribbage board or three, benches, night stands, a kitchen island, an entertainment center, etc, etc. all without a jointer. When you don't have room, you do it some other way or on very occasions, find someone to do it for you. You can certainly do without. Thousands of us do. Maybe someday, but not this day. A little late for that. About 5 years ago I cut all the rails and stiles for a couple of dozen Shaker style kitchen cabinet doors. 100+ boards. Many different lengths and widths. All of the boards have been grooved and most of the tenons were cut. Changing my design would mean starting over, throwing away a lot of wood and a lot of man-hours. Now that I'm back at it, I've discovered that some of the boards are thicker than others. A rookie mistake 5 years ago, but I didn't have a planer at the time anyway. Now I do, and I think I can fix the problem as I dry fit each door and determine how much, if any needs to be planed off. That's why sending them out will be troublesome. This is going to be long drawn out process, a door here and a door there, as time allows. Spring is coming. Vacations, graduations, outdoor projects, etc. I won't be doing it. I don't have to solve that issue, because I won't be planing cross grain. :-) I'll find another way to thin the boards without snipe. I tried a couple today and found that if I send them in at an angle, there is virtually no snipe. That will work as long as it's the rails that are thicker. We'll have to see about the longer stiles. At 2 1/2", maybe re-sawing (essentially shaving) them on the table saw will work. You were from your POV, I was from mine...if it were me, I'd make the room...if you want to continue to struggle, so be it; your call. Yes, POV certainly matters. So does actual physical limitations and the balance between working wood and the rest of day-to-day life. Marie Antoinette is famous for uttering the phrase "Qu'ils mangent de la brioche", essentially "Let them eat cake." This is often attributed to the supposition that she had a poor understanding of the peasants' situation. From my POV, your "I'd make the room" comment sounds a lot like "Let them eat cake." You may have heard me mention that my shop is rather small. By small I mean less than 1.5 times the size of the average prison cell in the US. By small I mean that every inch of wall space is used up. By small I mean that ripping boards longer than 5' means rolling the table saw into middle of the shop and angling it so that I can start the cut from out in the back yard. By small I mean that my planer is out in the garage, up the stairs and on the opposite side of my house. It's on a rolling cart and other garage items need to be moved in order for it to be used. By small I mean that assembling anything larger than a drawer means setting up an assembly table in the main part the basement, much to the displeasure, but luckily also to the understanding, of SWMBO. By small I mean that my band saw is currently tucked behind the furnace because I didn't have room to build the bench for my daughter with it in the shop. By small I mean that I have already spread my jig and tool storage out into the main part of basement, again impacting SWMBO's use of the space. So you see, it's not just as simple as "I'd make the room". When there is no room, there is no room. Translation: "Qu'ils mangent de la brioche"
I had that same idea last night. As I mentioned, it's been 5 years since this project was started. I need to pull out a few more frame parts, dry fit them and see if that is an option. Nothing at all meant more than simply it is my particular POV and I'd put a shed in the back yard if needed or pick another hobby. We all have choices to make; it's your decision as to what you want more. Really? How about just living without a jointer? I have a bench top one stashed away in the box since I got the Delta six inch. A) Ayup. B) Not if were going to do large-piece ww'ing, no. Anything over what I want to do with hand tools. I use almost all roughsawn stock and reclaim a lot of old material as well. It may or more often will not start out with a surface in plane. I've really regretted leaving the 12" Crescent in TN and only bringing the 8" Rockwell/Delta back to KS. However, almost 50 yr ago I began w/ a little old Craftsman 6" though, that could have been made to work as a benchtop. Typically snipe happens because of the play in the cutter head. Or the material is not PERFECTLY flat. I always lifted the board a bit as it entered the planer and again on the out feed side I lifted the end of the board as the material exited the planer. Typically, it happens because of the feed rollers. Only one roller apples pressure at the beginning and end of the cut, creating uneven pressure. You can tell because the snipe is always the length of the distance of the in feed/out feed rollers from the blades. Lifting the work piece at the beginning and end of cut tends to offset this somewhat. To eliminate the problem is difficult, and best done by allowing room to cut off the sniped ends. If that is a problem, then run sacrificial boards. If that is a problem, then cutting at an angle can reduce the length of the snipe as the board will be supported a bit more through the feed rollers. Thanks for jumping in so late and repeating everything that has already been cover in this thread. In terms of a synopsis, it's not bad. Sealing End Grain For Stain: Pre-Stain or Shellac? Temporarily turning off hot water in a combination boiler system? Anyne recommend a cheap scale-reducer for an electric shower? laminate plywood or wood -- sources? And now ... a *bad* idea?